Can’t get enough chicken wings? Try kicking your wings up a notch with a couple of secret strategies! 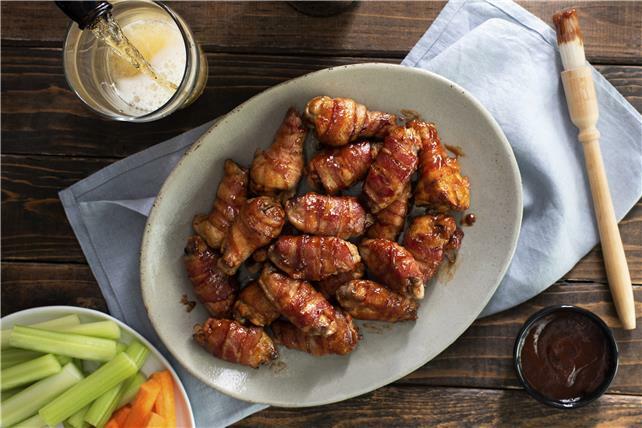 A simple marinade teams up with the smoky barbecue sauce to create the perfect sweet-and-tangy glaze for these flavourful oven-baked wings. You’ll never believe how easy these wings are to make. Once you try them, we guarantee they’ll be making an appearance at every game night, potluck or backyard cookout in your future. Mix first 3 ingredients until blended; pour over wings in shallow dish. Turn to even coat both sides of all wings with lime juice mixture. Refrigerate 1 hour to marinate. Place wire rack on rimmed baking sheet. Remove wings from marinade; discard marinade. Wrap bacon pieces around wings; secure with wooden toothpicks. Place on wire rack. Bake 30 min. Reserve half the barbecue sauce for later use; brush remaining barbecue sauce evenly onto chicken. Bake 10 min. or until wings are done, turning after 5 min. and brushing with reserved barbecue sauce. Serve with additional Heinz Kansas City Style Sweet & Smoky BBQ Sauce and/or Kraft Rancher's Choice Dressing.